Saturday morning 9 am. In a narrow lane in Banaswadi, Bengaluru. A school. Vibrant, bursting with energy! Hundreds of children, chattering away in English, Hindi, Kannada, Tamil, Telugu. It's a full house. You can almost smell the excitement in the air. Akkas and Annas have come. New faces with new stories. This was the Storytelling Saturday! 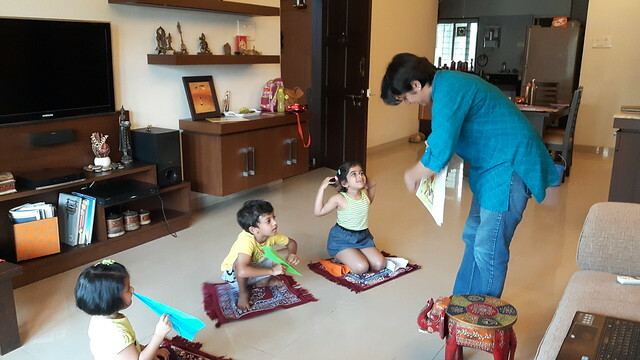 One fine day in March, just before the exams started, we decided to give the tiny-tots a break and let them spend a Saturday listening to stories, thanks to volunteers from Oracle Banaglore. A school that our dear friends at Akshara Foundation do commendable work with, was the chosen destination. We gathered children from standard 4 to 8 and set the ball rolling. Our Pratham Books colleague Shruthi, opened the session by introducing the volunteers, the session and playing a little game with the children to wake them up completely! Once the entire hall was bubbling with excitement, volunteers from Oracle started with Gayathri Tirthapura and Kabini Amin’s 'Dum Dum-a-Dum Biryani' - story about a sibling team, their love for cooking and the power of Maths! The children listened in rapt attention, joining in every now and then to do mental calculations as Basha and Sainabi went about measuring the ingredients. Once the story finished, we slipped into the activity mode with children dividing themselves in groups and playing a game based on maths and numbers. This was followed up with another lovely tale, 'Up World, Down World' by Padmaparna Ghosh and Sunaina Coelho which took children through the canopy forests and introduced them to its various inhabitants. The session ended with a prize distribution for the winners in the activities and lot of cookies going around. "Walking into a land of fantasy is always an exciting experience. When you have a room full of enthusiastic kids with you, it is even more fascinating. Such was my experience as I got the opportunity to be a part of the storytelling initiative at the Government Kannada Higher Primary School. One can never match the children’s level of enthusiasm. As all the volunteers from Oracle, introduced themselves to these adorable children, they were more than happy to greet us and often paid us a compliment with 'Nice name!'. 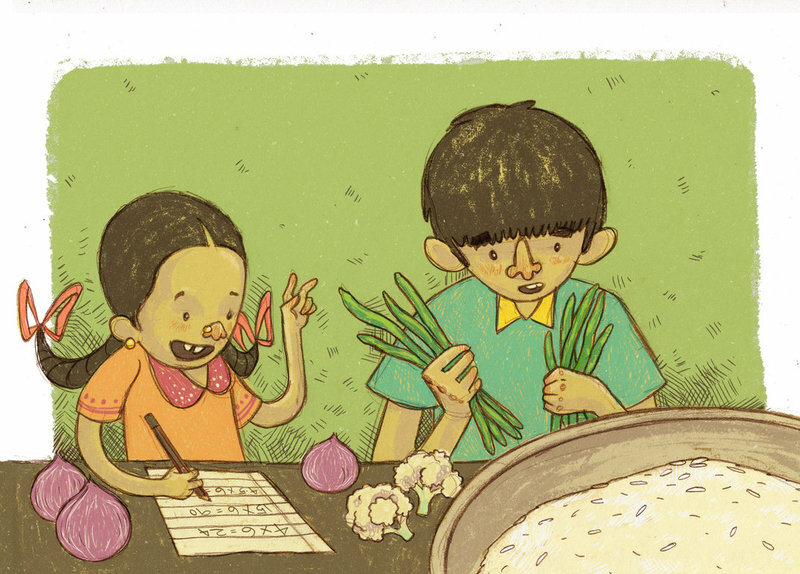 As Bhanu started with our first story, 'Dum Dum-a-Dum Biryani', and Pramodh helped with the translations to Kannada, children got into the mood and we were all transported into the world of Basha and Sainabi as they cooked the world's best Biryani. I know I was drooling with the details of the Biryani! Once the story was done, we engaged the kids with mathematical activities related to the story. They were all divided into groups and each of us took on responsibility for one group. Of course, we had all the support from the teachers & staff of the school. 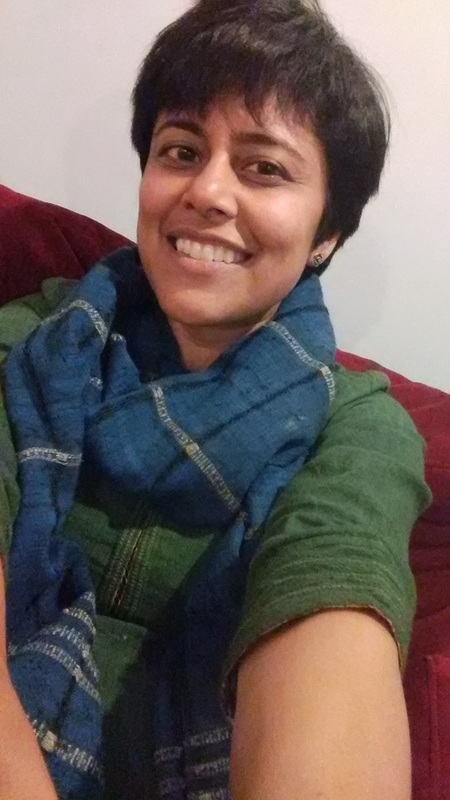 Manini took over the next story, 'Up World, Down World', and the children seemed engrossed in the story and the vivid pictures of the little girl, Fatima and her animal friends. The children were playful and naughty and adorable throughout. There was no hint of inhibitions as they surrounded us, asked questions & shook hands. The cookies and the toffees were a hit with them. Their joyous spirit was beautifully captured by Pradeep. I would like to thank all the volunteers who came with family or by themselves and made the event a success. Vivek & Pradeep came with their families, Manini brought her mom along, Bhanu's son was present, Pramodh and Shashank, Mohammed Saleemuddin, Prathik and Devey came too. I know I speak on behalf of all of us, when I say that we had the most wonderful time and I can't express enough gratitude to Payoshni and her team from Pratham Books, for giving us this opportunity. Finally, we walked away with happiness and memories of those million dollar smiles filling our hearts & brightening up our day!" By the time the session ended, the sun was beating down on us with all its might but everyone in the school had a smile on their face, a smile that expressed a day well spent! 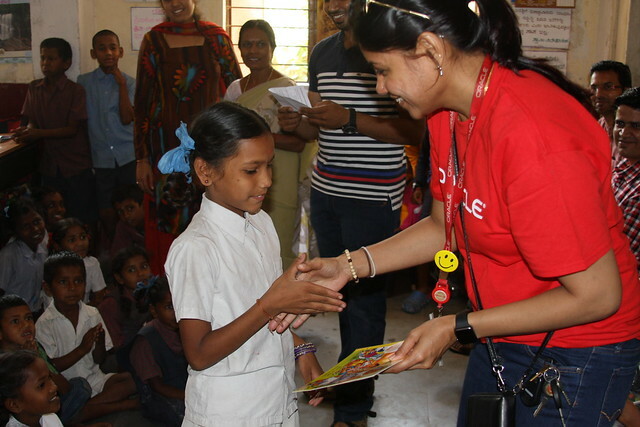 We thank Oracle volunteers for their time and enthusiasm and the Akshara Foundation and Government Kannada Tamil Higher Primary School for opening up their classrooms for the session. Click here to see more pictures from the session!